The grounds of Luton Hoo were originally laid out by ‘Capability’ Brown c1770, for John Stuart, the 3rd Earl of Bute, who was Prime Minister for a short period from 1762-63. In 1903, Sir Julius Wernher – who made his fortune from the Kimberley diamond mines of South Africa [i] – bought the estate, and made many alterations and additions to the house and grounds. One of the contractors engaged on this project was James 3 – although it is not easy to be positive about the provenance of some of the formal features. There is a ‘Luton Tub’ listed in the firm’s Garden Ornament Catalogue, and the balustraded wall and sundial patio on the terraces at the back of the house look to be very much in their style, although the sundial itself is a replacement. 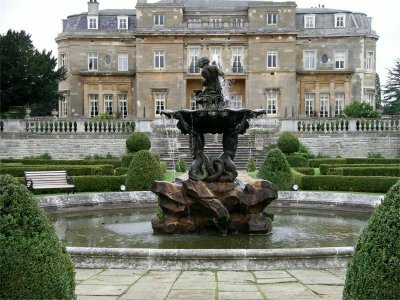 Similarly, the round basin of the fountain is almost certainly their work, and the rock base of the fountain itself (Fig 1) is reminiscent of the fountain at Wotton Park. The putti supporting and topping the bowl also look as if they came from the Pulham manufactory, but could possibly be replacements of some Pulham originals. 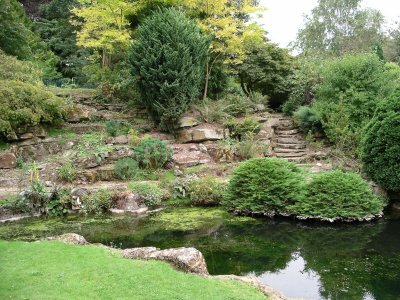 Moving down the garden, away from the parterre, the path curves down to the rock garden, which is known to have been constructed by the Pulhams in 1909-10. [ii] As one can see from Fig 2, it sits in the bottom of a pretty dell, along a pretty rock-lined stream, with islands and rocky ‘cliffs’ and rustic steps that lead off over the far bank. This is a mixture of artificial and natural stone, which is quite different to the totally Pulhamite garden at Buckingham Palace that was built some seven years previously. This may have been the reflection of a trend in rock garden styles over the intervening period, but is more likely to have been due to the ready availability of natural stone in this area at that time. Fig 3 shows the bridge that crosses the stream, which is in a rustic style very similar to the two at Buckingham Palace. 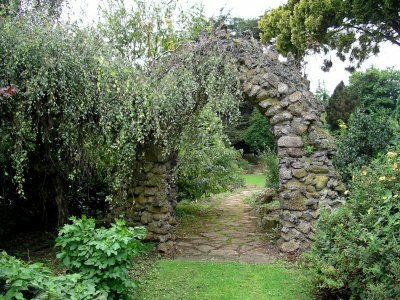 The path by the side of the stream leads up the steps to a stone archway, shown in Fig 4, and, although one can hardly say that it looks ‘natural to the place’, it is certainly one of the more solid and sturdy examples of similar archways that can be found in other Pulham gardens. 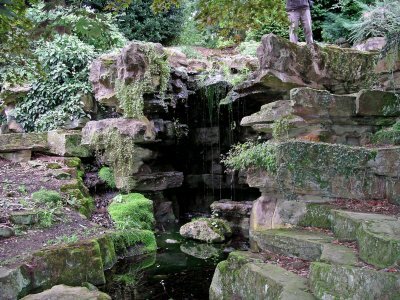 Returning along the side of the stream, and past the bridge, a flight of steps leads to a massive grotto, shown in Fig 5. 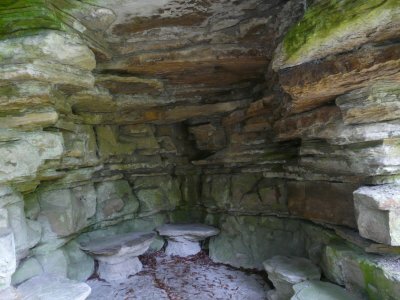 It is built on a grand scale, with some ‘mushroom seats’ around the base, although it is not quite as large as the ones at Waddesdon Manor, described and pictured in Rock Landscapes – The Pulham Legacy. Opposite here is another large grotto – Fig 6 – this time housing a waterfall that feeds the stream. The rocks have been stratified very carefully, although the prevalence of natural stone renders them rather less ‘naturalistic’ than a totally Pulhamite construction. The Luton Hoo Estate is now the home of the Luton Hoo Hotel, Golf and Spa – and a very impressive place it is, too. 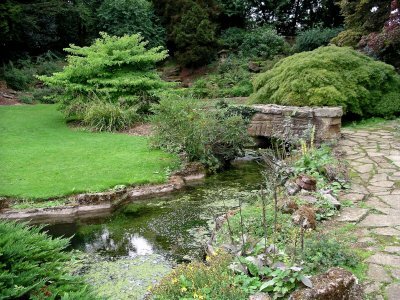 Posted on April 1, 2012 June 4, 2016 by Claude HitchingPosted in Sites Month 2Tagged 'capability' brown, . . James Pulham and Son, grotto, Luton Hoo, Pulham archway, pulhamite, rocky stream, rustic bridge, Sir Julius Wernher, waterfall.